Having just emerged from rain clouds over the south of England, the crew of this Junkers flying wing bomber find themselves surrounded by flak bursts and quickly take evasive action. The Junkers Ju EF 130 was an ambitious flying wing bomber design that didn't progress beyond the drawing board status. It was to be made of non-strategic materials (wood) with a pressurised cabin in the front. It was expected to carry no less than 3000 kgs of bombs at 900 km/h. The end of WW2 put an end to this project as well. 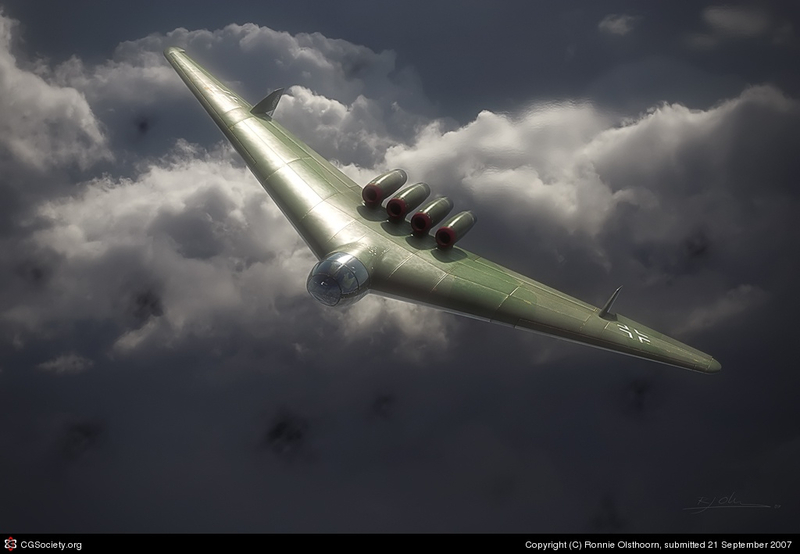 This image was made for [url=http://mmpbooks.biz/books/r5110/r5110.htm]Marek's latest book[/url] on German bomber designs of WW2.